Bournemouth Borough Council: Pure Town Planning have recently secured consent for alterations and a rear extension to an existing block of flats to form a further flat within the Meyrick Park and Talbot Woods Conservation Area. The scheme was designed by Barry J Mills Limited. As part of the application, we prepared a thorough supporting Design, Access, Planning and Heritage statement that set out the merits of the proposal in a clear and concise manner. This include addressing previous site history where there were two previous applications refused and dismissed at appeal for four additional flats and two additional flats respectively. The accompanying statement set out how the additional one flat addressed the concerns previously raised and that there was sufficient parking, amenity space and the rear extension would not be observable from the street that on planning balance there would be less than substantial harm to the wider Conservation Area. With the application submitted, the Council requested various changes to the application, which were swiftly undertaken. Due to the number of objections that were received against the application the application had to be taken before Planning Committee to be determined. Richard gave a clear and confident deputation setting out the planning merits of the application. 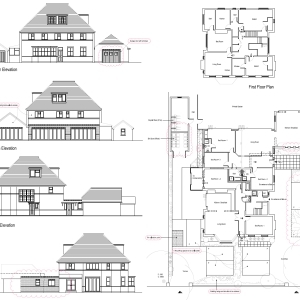 After thorough discussions of the scheme, the application was subsequently granted planning permission.